Mystery Tackle Box is the #1 fishing tackle subscription service offering anglers and fishing enthusiasts a fun and affordable way to discover new fishing lures, learn new techniques and catch more fish! 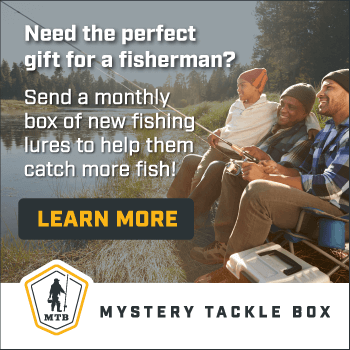 If you, or someone you love, enjoys fishing, get them a Mystery Tackle Box Subscription today. You'll enjoy a monthly box full of new and innovative fishing lures and products, content on how to use everything, plus stickers and special offers. Get a box full of new fishing products delivered straight to your door. Subscriptions start at $15 per month. Coupon valid through December 31st, 2017. Visit http://mtbfish.com/holidaygiftUSFAM to learn more! Cassandra's Review- I enjoyed finding out the mystery lures included and look forward to finding the correct types of water to fish with them. I think this is a great subscription if you are looking for great ideas and gifting to an experienced fisherman that has lots of options. I would like to probably pick my own products to include, but I see how the need to vary pricing the items helps to keep the cost lower on the experience. The lures were really nice quality and would make a fisher very happy. The shipping time was a little long.